The authorities responsible for the import of food, including meat, for the US market are: the FDA (U.S. Food & Drug Administration), and the FSIS (Food Safety and Inspection Service), an organizational unit of the USDA – (United States Department of Agriculture). The rules regarding production, production supervision and export of food to the USA have been included in a number of legal acts, including the Federal Meat Inspection Act (MIA), the Law on Modernization of Food Safety (Modernization Act), as well as in the relevant FSIS and Federal Code of Conduct Regulations (CFR). The export of meat and its products to the USA is only possible from countries whose food safety supervision system has been recognized as equivalent to the US system and only from establishments approved by the competent veterinary services and listed on the specific list. 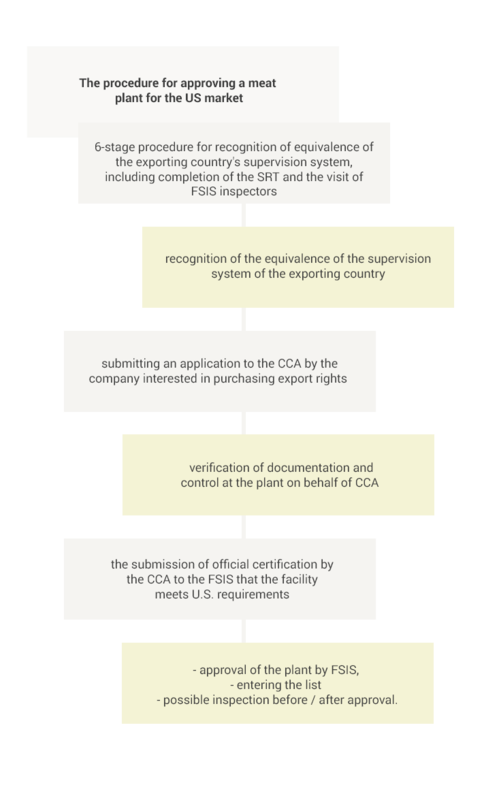 The equivalence of a given country is determined by the FSIS on the basis of a 6-step procedure, the two most important elements being an assessment of the extensive documentation provided by the central authorities (CCA) of the applying state (the so-called SRT-Self Reporting Tool) and then the on-site visit to verify the information contained in the application. After official recognition of the equivalence of the procedures used in a given country, the FSIS relies on control activities carried out by the CCA in that country. Therefore, a company interested in purchasing export licenses for the US market submits a relevant application to the CCA. Then, after proper verification, the CCA provides FSIS with official certification that the entity meets the US requirements. In addition, the FSIS may carry out additional on-site inspection before or after approval of the establishment to ensure that the food safety system remains equally valid at the company level. Registration is valid for two years. It should be noted that for each registered foreign plant, a representative established in the United States should be provided. US food law requires that food products imported into and sold in the United States do not carry or contain any toxic or harmful substances that may make them harmful to health, and that they do not consist wholly or partially of contaminated substances, rotten or decaying substances, or in any other way unfit for consumption. Manufacturers do not need to provide the FDA with any test results as a condition for production, marketing and distribution of food products, and the FDA does not accept any food samples from producers, importers and distributors. Meat plants should have operational procedures related to sanitary standards (so-called SSOP) in accordance with the requirements of Title 9 of the Federal Regulations Code (CFR). In addition, exporting establishments should apply the current US Food GMPs (Good Manufacturing Practices) for food products. These practices define the basic factors that manufacturers and distributors should take into account to ensure cleanliness and food safety during its production, processing, packaging and storage. Good Manufacturing Practices can be found in Part 110 of Title 21 CFR. The FDA regulates the issue of additives used in food products. New food additives must be approved or inspected by the FDA prior to being placed on the market. The FDA also regulates food packaging materials and substances in contact with food. Packaging materials must be safe to use and must not transfer harmful substances or stale flavors and fragrances to the packaged product. In the case of foods known as 'low-acid canned foods' (LACF) or 'acidified foods' (AF), it is subject to special requirements, and plants exporting such products, to additional registration in the FDA. Each shipment exported to the US must be accompanied by an official health certificate. The document is issued by the competent authorities of the exporting country, and its design is available on the websites of these authorities. 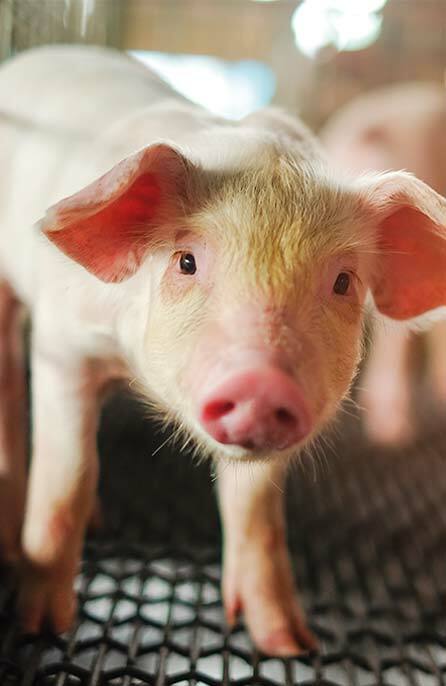 The US veterinary authorities draw attention to the following animal diseases during import of meat and its products: rinderpest, foot-and-mouth disease (FMD), swine vesicular disease (SVD), African swine fever (ASF), and classical swine fever (CSF). 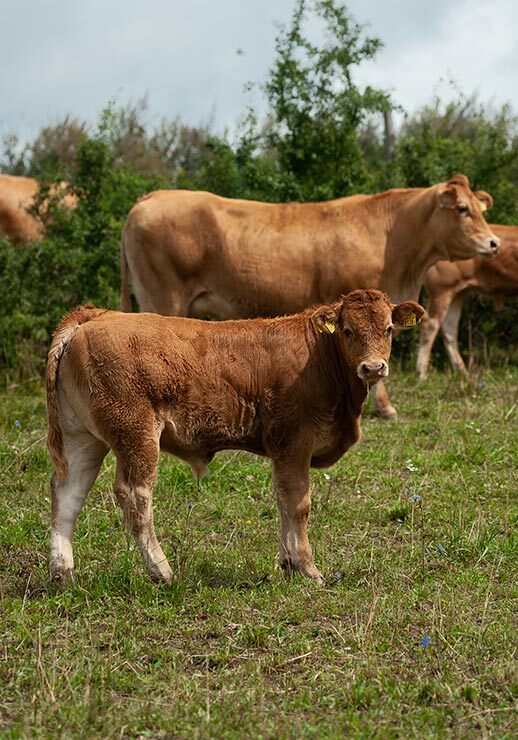 The USA, as a member of the World Organization for Animal Health (OIE), respects the principles of regionalization in the case of specific infectious animal diseases, including FMD, SVD, ASF and CSF. In the case of products containing raw beef, producers must have implemented test procedures for E. coli O157H7 sticks. Also, in the case of meat plants producing ready-to-eat foods (RTE), it is necessary to implement an appropriate methodology for testing Listeria monocytogenes.